Author(s): Gegotek Agnieszka, Ambrozewicz Ewa, Bielawska Anna, Bielawski Krzysztof, Cyunczyk Monika, Skrzydlewska Elzbieta. Department of Inorganic and Analytical Chemistry, Medical University of Bialystok; Mickiewicza 2D, 15-222 Bialystok, Poland. The metabolism of alkylating agents is accompanied by the generation of reactive oxygen species. The aim of this study was to treat estrogen receptor-positive and estrogen receptor-negative human breast cancer cells, MCF-7 and MDA-MB-231, respectively, with cisplatin and five different berenil-platinum (II) complexes, and then to investigate the oxidative modifications of DNA, lipid and protein, and to compare them with the profile of various pro- and antiapoptotic proteins. Changes in the levels of 8-hydroxy-2’-deoxyguanosine, 4-hydroxynonenal, carbonyl groups, dityrosine, active caspases 3, 8 and 9, as well as the expression of Bcl-2, Bax, cytochrome c, and p53 were subsequently examined. Activities of superoxide dismutase, catalase and glutathione, vitamin C levels were also investigated. Cellular reactions to cisplatin and the berenil-platinum (II) derivatives were more pronounced in MCF-7 cells as compared with the MDA-MB231 cells. Furthermore, the berenil-platinum (II) derivatives were found to be more effective than cisplatin. All of the complexes reduced the activity of superoxide dismutase and catalase, and also lowered the levels of non-enzymatic antioxidants. Increased level of lipid, protein as well as DNA damage markers was also observed after berenil-platinum (II) derivatives treatment. Similarly, the increase in the levels of the proapoptotic factors, were detected in MCF-7 and MDA-MB231 cells. Incubation of examined cells with the berenil-platinum (II) complexes also led to the increase in the levels of active caspases 3, 8 and 9. In conclusion, the results of the present study demonstrated that berenil-platinum (II) complexes more efficiently mediate cellular oxidative modifications and proapoptotic metabolism, particularly in MCF-7 cells, compared to cisplatin. Pt2(isopropylamine)4berenil2 and Pt2(piperidine)4(berenil)2 notably affected the cellular metabolism of estrogen-positive breast cancer cells. Thus, these complexes may be valuable for the design of additional anticancer drugs. Keywords: Antioxidants, apoptosis, cisplatin, dinuclear berenil-platinum(II) complexes, oxidative stress. Affiliation:Department of Inorganic and Analytical Chemistry, Medical University of Bialystok; Mickiewicza 2D, 15-222 Bialystok, Poland. Keywords:Antioxidants, apoptosis, cisplatin, dinuclear berenil-platinum(II) complexes, oxidative stress. Abstract:The metabolism of alkylating agents is accompanied by the generation of reactive oxygen species. 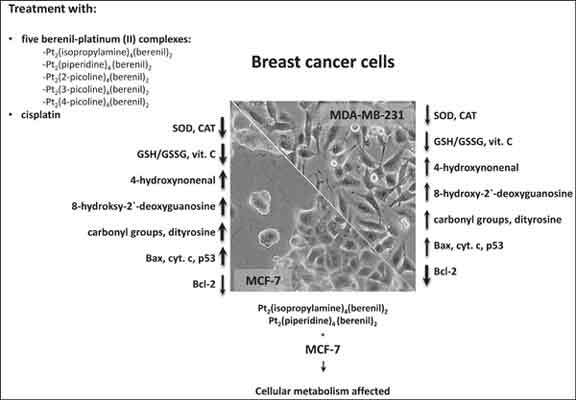 The aim of this study was to treat estrogen receptor-positive and estrogen receptor-negative human breast cancer cells, MCF-7 and MDA-MB-231, respectively, with cisplatin and five different berenil-platinum (II) complexes, and then to investigate the oxidative modifications of DNA, lipid and protein, and to compare them with the profile of various pro- and antiapoptotic proteins. Changes in the levels of 8-hydroxy-2’-deoxyguanosine, 4-hydroxynonenal, carbonyl groups, dityrosine, active caspases 3, 8 and 9, as well as the expression of Bcl-2, Bax, cytochrome c, and p53 were subsequently examined. Activities of superoxide dismutase, catalase and glutathione, vitamin C levels were also investigated. Cellular reactions to cisplatin and the berenil-platinum (II) derivatives were more pronounced in MCF-7 cells as compared with the MDA-MB231 cells. Furthermore, the berenil-platinum (II) derivatives were found to be more effective than cisplatin. All of the complexes reduced the activity of superoxide dismutase and catalase, and also lowered the levels of non-enzymatic antioxidants. Increased level of lipid, protein as well as DNA damage markers was also observed after berenil-platinum (II) derivatives treatment. Similarly, the increase in the levels of the proapoptotic factors, were detected in MCF-7 and MDA-MB231 cells. Incubation of examined cells with the berenil-platinum (II) complexes also led to the increase in the levels of active caspases 3, 8 and 9. In conclusion, the results of the present study demonstrated that berenil-platinum (II) complexes more efficiently mediate cellular oxidative modifications and proapoptotic metabolism, particularly in MCF-7 cells, compared to cisplatin. Pt2(isopropylamine)4berenil2 and Pt2(piperidine)4(berenil)2 notably affected the cellular metabolism of estrogen-positive breast cancer cells. Thus, these complexes may be valuable for the design of additional anticancer drugs.